01 | November | 2008 | can i just finish my waffle? What Does Obama Mean by a Civilian National Security Force? July 2, 2008, in Colorado Springs, Colorado. Maybe we won’t notice or care that our freedom of speech is being taken from us little by little. Maybe we won’t notice that the Mainstream Media that did all in their power to get Mr. Obama elected will be the same media that will control and manipulate the people with the blessing of an Obama administration. We may even get so brainwashed that we will defend the investigation of private citizens, or the shutting down of local tv or radio stations, or the “punishment” of any newspaper or network who dares to ask a question or report any fact that is not apporved by the Administration. But, back to the point, they are already putting out their mouthpieces to condition us to the fact that there will be a very limited and censored amount of information getting out under an Obama administration. And if we aren’t careful, we will think it’s just fine. Governor of California, Arnold Schwarzenegger, appeared at a rally for John McCain in Ohio yesterday. Schwarzenegger said, “John McCain has proven what kind of a man he is. We don’t have to wonder if he’s ready to lead. We don’t have to wonder is he ready to be president of the United States. 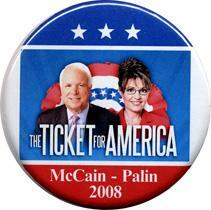 John McCain has served his country longer in a POW camp than his opponent has served in the United States Senate.